First off I’d like to say that I have a peanut allergy. Crazy, I know. So why would I want to whip up a batch of Peanut Butter cookies? Because I’ve convinced myself I can eat a small amount without breaking out in hives. And really, who can stay away from peanut butter?? Especially Reese’s. So when my brother asked me to make cookies again, and when I saw we had a large jar of Peanut Butter I decided I wanted to make some good old peanut butter cookies. Something I haven’t done in three years! Of course I didn’t really eat any, and let the taste testing up to my mom and brother. But I did nibble on a small one..or two, topped with Nutella. That should cancel out all the peanuts right? MmMmm, oh well. 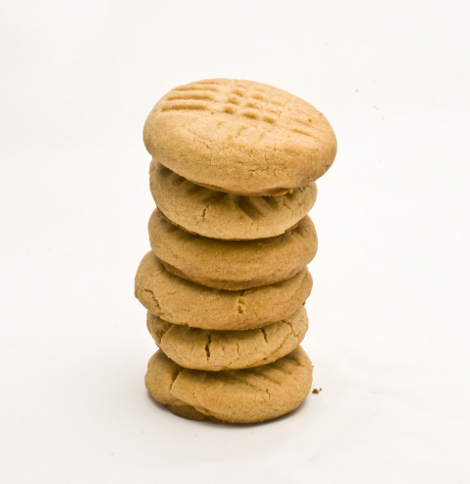 These are really yummy and taste just as a peanut butter cookie should. Crunchy on the sides and soft and pea-nutty in the middle. Martha pulls through once again. But then why wouldn’t she, she’s Martha. These cookies were originally supposed to be chilled for several hours before baking, but I didn’t read that far before beginning and didn’t want to wait. So I modified it a little. If you would like the original recipe click here. These ones looked good also! Preheat oven to 350 degrees. Prepare a baking sheet with parchment paper or a silpat. Sift together flour, salt and baking sodea, and set aside. In the bowl of an electric mixer fitted with the paddle attachment, beat together butter and sugar on medium speed until light and fluffy. Add egg and vanilla, and beat until well combined. Add peanut butter, and beat until smooth. Add flour mixture, and beat on low until combined. Form each cookie into a ball using about a tablespoon of dough. Place cookies on the prepared baking sheets, about 1 inch apart. Place cookie sheet in freezer for about 10-15 minutes to chill. If they stay in the freezer too long they will be hard to flatten, so place them in the oven for a few minutes, and then take them out to press them. Remove from freeze and flatten them slightly with your palm or the bottom of a cup or spoon. Then dip a fork into flour, and tap off excess. Press fork slighty into the cookies to make a decorative top. Bake until golden, about 15 minutes. Check and if needed, bake about 5 minutes longer. Remove from oven, and place on a wire rack until completely cooled. 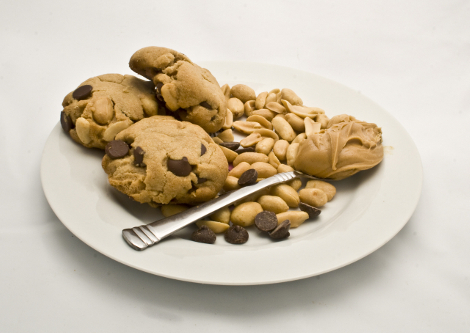 For a little variation you can add some chocolate chips and peanuts for crunchy peanut butter cookies. Just flatten them slightly and bake. Kraft is NOT recalling any products in connection with the recent salmonella outbreak involving peanut butter manufactured by Peanut Corporation of America (PCA). 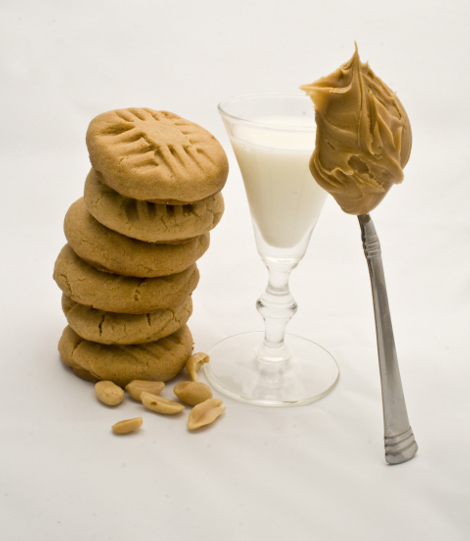 Neither we nor our suppliers purchase peanut butter or paste from PCA for any of our products, including those sold in the U.S. or Canada under the Kraft, Nabisco and Planters brands. Kraft ‘s highest priority is the safety of our consumers, and we’re actively monitoring developments around the current recall of peanut butter. We are providing this information as suggested by the U.S. Food & Drug Administration (FDA). 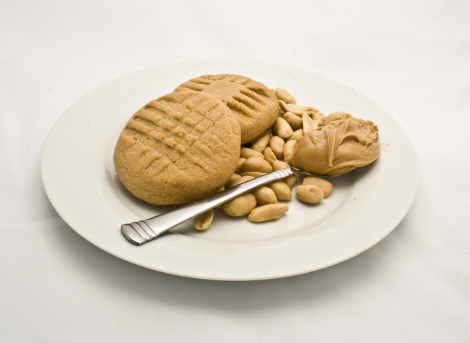 For information about the peanut butter recall, your best source is the FDA website. They look utterly delicious. Perfect! Love your blog. I am going to spend some time looking around here. Things look great. They were quite delicious, from what I ate! Thanks Donna! I hope you find some more you like! Love how you set up your photos! So, did you get any hives or did the nutella hold ’em off? 🙂 I like how you think. Thanks Ingrid! Haha I didn’t get any hives, but I did notice some small red blotches this morning..hmm..maybe i should stop nibbling…right about..now. haha. I think it’s safe, and the nutella canceled out the peanuts. Hi, I just came across your website looking for a good peanut butter cookie recipe and this sounds like a great one. However, as a physician and I feel like it would irresponsible for me not to comment that if you are breaking out into hives when eating peanuts, you really should avoid eating them. Your reaction to it may worsen with each exposure and you could run into a lot of trouble, including swelling of your airway and difficulty breathing. You should get allergy testing if you want to be sure, but for now it’s better to be safe! SH: thanks for your concern! I did actually have allergy testing done in 2005 and didn’t eat peanuts for about 2 years. but i introduced it slowly and it acutally isn’t an allergy anymore. I haven’t broken out any time i’ve eaten a few peanuts! hope you tried the recipe! thanks again! Wow those look delisious!! I think I am going to make some right now!! I loveeee baking ( even though I am only twelve… ) I can’t wait to try them!! R¨¦el succ¨¨s vient petit pi¨¨ces jour apr¨¨s jour. Vous devrez ont l’avantage de la vie tous les jours peu tr¨¦sor doudoune moncler http://doudouneclive.beeplog.com/ doudoune monclerJe suis tout le temps ¨¤ la recherche de r¨¦troaction…. I’ve never been able to make the right peanut butter cookies. Heaven help me – they just hate me. I’ve been using it for a couple months, it was a hit over Christmas and I use it whenever I need some cookies floating around. Thanks Heather!! I’m glad you like them. I absolutely love peanut butter cookies, my boyfriend however doesn’t love them. Iseem to make chocolate chip ones more often. But I have definitely been craving these ones! !